America is blazing today. Cannabis aficionados across the continent are gathering to celebrate 4/20, the unofficial, counter-culture holiday enjoyed annually by millions. So many revelers observe this holiday, in fact, that here in our beloved hometown of San Francisco a capacity crowd of over 15,000 is expected to converge on Hippy Hill in Golden Gate Park to partake, and enjoy our beautiful Spring weather. Much has been said in recent years about marijuana legalization and its impact on tourism. Most of this talk has been simply the personal opinions of those who (for either political or monetary reasons) have an agenda and interest in the conversation’s outcome. As devoted seekers of the unvarnished truth, our tolerance here at Destination Analysts for opinion unsupported by data is low. So, we’ve done a little exploration, and in the free-wheeling spirit of the day, we thought it would be fun to look at some pot stats we’ve collected from our The State of the American TravelerTM survey. As it turns out, not a huge proportion of tourists actually visit marijuana dispensaries while traveling. Only 3.4 percent of all American leisure travelers have visited a marijuana dispensary while traveling for in the past year, making this niche a relatively small one. Given the size of our traveling population, this means about 6.3 million persons participated in pot-related activities while traveling last year. 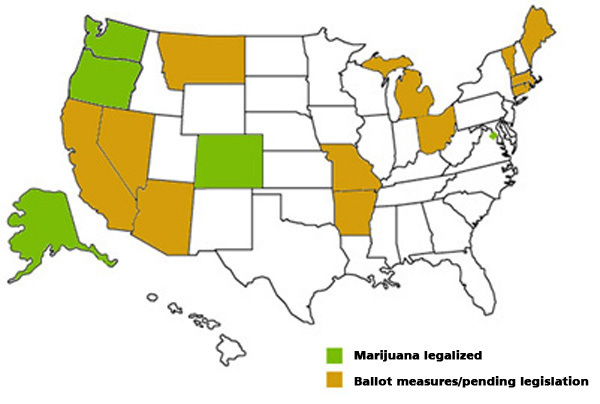 This small market makes sense, of course, as few states have actually taken the steps to legalize. As of today, only Colorado, Washington, Oregon, Alaska and the District of Columbia have taken the step, leaving most of the country out of the game. Chart source: The State of the American Traveler, Destination Analysts, Inc.
How pot legalization will play out in terms of the overall economic impact in a given destination obviously can’t be divined from a national survey like this. However, it’s clear that marijuana tourism has appeal in certain segments, as well as the potential to turn other visitors off. Given the unfortunately controversial nature of this topic, we’ll be surprised if a comprehensive and credible study emerges examining the economic impact of these laws on specific destinations. Marijuana tourism is clearly more popular with the young. Our survey shows that 6.3 percent of Millennial travelers visited a marijuana dispensary while on a leisure trip in the past year. They were three times as likely as Baby Boomers (2.1%) to do so. Among travelers rating legalization as “Appealing” or “Very appealing” fully 46.0 percent were Millennials. Only 15.8 percent of those who find the practice on some level “unappealing” are from this younger generation. In fact, pot tourism appeals to a different overall demographic. Comparing travelers who find marijuana legalization to be an appealing destination attribute to those who don’t, those in the appealing camp tend to be more diverse (ethnically), more likely to be single, less likely to have completed college and have somewhat lower annual household incomes. The naysayers also have bigger travel budgets, and report they expect to spend 17 percent more on leisure travel in the upcoming year than those who find legalization makes a place more appealing. Yet people who approve of pot travel more. Those finding legal marijuana appealing took an average of 4.6 leisure trips in the past year. Travelers who find the practice unappealing took only 4.1 trips.